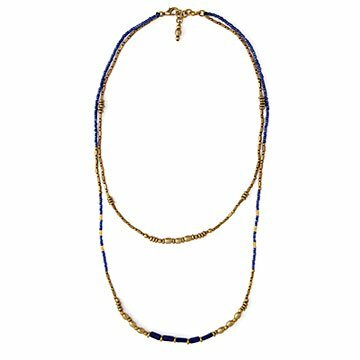 Nepalese women artisans string mixed beads in a symmetrical pattern to create this layered necklace. The design of this beaded necklace blends symmetry and texture. Women artisans in Nepal string the beads in patterns of contrasting neutral colors, sizes, shapes, and materials—glass and brass. Lined up in two eye-catching layers, it's a carefree, versatile accessory that quietly demands a second glance, whether it's paired with a t-shirt or a tailored suit. Designed in the US. Handmade in Nepal.